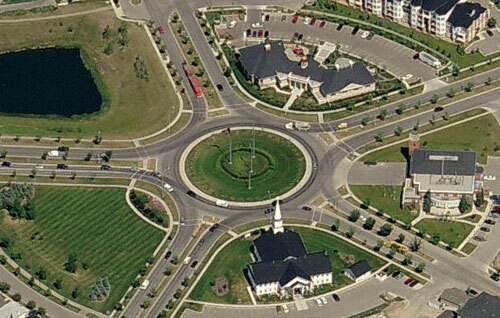 Pictured above is the traffic circle located in Mackenzie Towne. While most of the “traffic circles” in Calgary are of the miniature single lane traffic calming variety, this one is a dual lane version connecting five roads together. The traffic circle was built not only to move traffic more efficiently than intersections with traffic lights, but also to move the traffic in the area with a higher degree of safety. With traffic all going in the same direction, head-on collisions and right angle (t-bone) accidents are prevented. The environmental benefits are there too since there are no cars stopped at red lights with the use of a traffic circle. Thats great! properly designed roadways to handle traffic is a rarity in Calgary. Just look at how many new “interchanges” have lights. Mackenzie Towne residents know the real reason why the city prefers to build interchanges/intersections with traffic lights. Many drivers don’t know how to properly navigate a traffic circle! When uneducated stupid drivers enter the traffic circle and drive all the way around the circle in the right lane oblivious to the drivers honking at them, the traffic circle goes from efficient roadway to fancy looking roadway with long queue of cars waiting to get through. This handy little guide is for all the frustrated drivers out in Mackenzie Towne who are sick of drivers that don’t know how to navigate a traffic circle. Hopefully people will read this post and share it with people they know who drive in the area. 1. Before arriving at the traffic circle, figure out which exit you will be taking as it will determine which lane you should use. You may actually use either lane but we’ll get into that later. Traffic flows counter clockwise in the traffic circle, so on this particular traffic circle there are 4 exits, and 5 technically if you want to go back the way you came from. If you plan on exiting on the first 2 exits, you’ll want the right lane. For exits 3 and 4 (or 5), you should be in the left lane. 3. When entering the circle, wait for cars to pass and enter. If you are in the left lane, stay in your lane and go to the inside lane of the circle. When you reach the exit you want, stay in your lane when exiting. Remember, you have the right of way and traffic in the right lane should be yielding to you. If you entered from the right lane, exit the circle in your own lane. If you want to proceed past an exit, simply yield to traffic in the left lane that may be exiting and continue through to your exit. It’s great that the City of Calgary is looking at ways to improve our roadway system both for drivers and for pedestrians, but in this case I feel there needs to be a stronger educational campaign involving driving schools. Perhaps the test should include a quick trip to the traffic circle in Mackenzie Towne! Feel free to add anything that was missed by leaving a comment to this post. Also, if you feel any of this is inaccurate, please share! 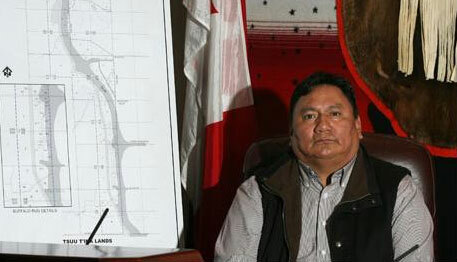 When the Tsuu T’ina nation surprised Calgarians (and Premier Ed Stelmach) by voting against the proposal that would have saw the SW portion of the ring road cut through their reserve, the Municipal and Provincial Governments immediately began working on alternative plans. Action on the alternative plans was so swift that even the Tsuu T’ina nation seemed to be caught off-guard as Chief Sandford Big Plume held onto his hope that talks would resume. Unfortunately for Big Plume, the Province of Alberta and the City of Calgary were done talking. 40 Years of talking is too much, even for politicians. “does not consent to any road construction on or near Tsuu T’ina Nation lands not accounting for the Tsuu T’ina Nation’s rights to enter and leave lands at any point along our borders.” It goes on to say that “any interference by the city of Calgary of Tsuu T’ina Nation’s rights to enter and leave its lands at any point along Tsuu T’ina Nation boundaries constitutes a breach of our rights under Treaty No. 7. Brilliant. I say if you’re going to play hardball, you better be ready to deal with the outcome. The Tsuu T’ina gambled for a better deal from the Province and City but their bluff was called. They now face the prospects of getting nothing and may even lose a key entrance to their Grey Eagle Casino. Perhaps the gambling should best be kept inside the casino. When the Tsuu T’ina Nation voted against the Ring Road deal, The City of Calgary promised quick actions on a Plan B and today it has announced plans to alleviate the traffic congestion faced by commuters everyday along Glenmore Trail at the 37th street intersection. 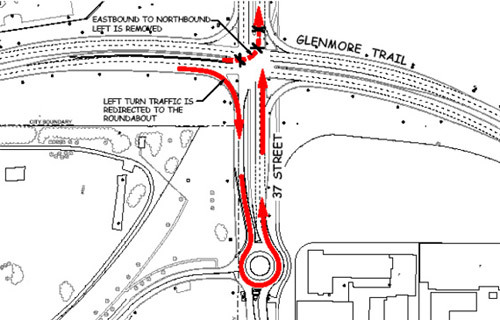 The solution, albeit a temporary one, is to no longer allow eastbound traffic on Glenmore to make a left turn to head north on 37th street. Instead, they will make a right turn to head south on 37th street where they will enter a roundabout / traffic circle to turn around and head north again. The City admits this is not a long term solution, but only one that will temporarily ease the congestion. The good news is that construction will start as early as next week and it should not disrupt traffic as it is on a relatively quieter section of 37th street. The project is expected to take about a month to complete so we will not have to wait long to see how well it will work. The City estimates that the construction of the traffic circle and accompanying changes will cost about $250,000. A proper long term solution to the congestion in the area is a full interchange with a pricetag of $85M. I see this as a great solution. It does not cost that much, and eliminating the left turn allows traffic on Glenmore to keep moving for an extra 20 seconds. Cars blocking the left lane trying to get into the turn lane will also no longer be an issue. However, an issue that may potentially arise is that the increased westbound traffic flow will now bottleneck at the Highway 8 intersection. The City and province needs to move quick on the 37th street Ring Road and in the mean time expand Glenmore capacity in case of any future construction or planning delays for any alternate routes.